Main » Articles » Ugin the Sprit Dragon Revealed? Ugin the Sprit Dragon Revealed? The collector number is a little unclear but it appears to be '003' which would mean other colorless cards are included in the set. 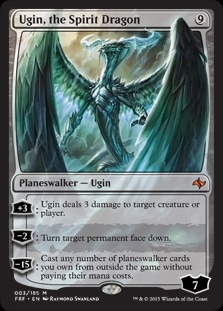 What do you think of Ugin? Does this look like the Spirit Dragon to you? Edit: Check out the Reddit thread for the latest discussion around this unconfirmed card. There's a lot of uncertainty and, as such, our Fate Reforged text spoiler reflects that it's unconfirmed.